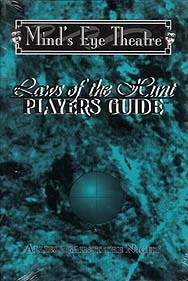 Laws of the Hunt Players Guide is the follow up to The Laws of the Hunt and is chock-full of new and exciting tools. Here are new societies, hedge paths and complete character creation for those with sorcerous inclinations. Also included are rules for the terrifying Dauntain, the hunters of the fae and stalkers of dreams. Lastly, new rules for the Reborn, the mummies, who walk the roads between the lands of the dead and the living.